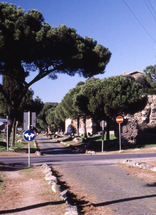 Via Appia Antica - Quo Vadis? Crustumerium is a Latin settlement located on the left bank of the Tiber, at only a few kilometers from the heart of ancient Rome. Founded in the mid 9th century BC, it grew into a sizeable town during the 7th and 6th centuries, only to be abandoned at the turn of the 6th c. BC., allegedly under pressure of expanding Rome. Archaeological excavations and surveys and, unfortunately, also looting practices, have, since Crustumerium’s discovery in the late 1970s, revealed an extremely rich burial record around the settlement as well as detailed information on the chronology, nature and extent of the settlement itself and its rural catchment. The presentation will, apart from a concise overview of work done since the 1970s, focus on the recent investigations carried out since 2006 by a joint team of the Groningen Institute of Archeology and the Archeological Superintendency of Rome. Especially the discovery of a huge artifical mound, presently under excavation, will receive attention, as this monumental structure forms a key element in our understanding of the settlement and mortuary history of Crustumerium. A complicated recipe in a late-antique Greek magical handbook in Ann Arbor describes how one can avert or escape fear. Its rubric is usually translated as “[Charms of] Hecate Ereschigal against fear of punishment” on the assumption that Hecate Ereschigal is a helpful deity. Ereschigal (i.e. Ereshkigal) was, however, a fearful underworld divinity in Babylonia, who punishes the dead, and both Hecate and Ereschigal (sometimes also accompanied by Persephone) appear together as agents of punishment on Roman-period curse tablets and in magical recipes for similar kinds of curses. I will argue that the sequence of protective speech-acts and gestures proposed by the recipe closely reflect those learned or performed by people during initiations into a mystery cult and that the punishment to be feared was originally in the underworld and in the afterlife. This lecture considers Minoan and Mycenaean dress within the broader context of the ancient Near East and Egypt. As valuable as precious metals, a significant commodity of trade, luxurious in design and decoration, Minoan dress rivaled that of its Near Eastern and Egyptian neighbors. This study traces the impact of Minoan clothing on its neighbors and finds that, among other things, some facets of Minoan ritual dress, and thus aspects of Minoan religion, originated in the Near East, were adopted by the Mycenaeans and continued in the Homeric epics. By considering Aegean dress within the Eastern Mediterranean milieu, it’s possible to identify indigenous costume innovations and transmissions and transformations from the Near East and Egypt. Since ancient Aegean textiles and garments have not survived, the study compiles a typology of the corpus of garments represented in sculpture, frescoes and glyptic to glean evidence for construction. It further considers the manufacturing techniques of extant Egyptian clothes, comparable images of ancient Near Eastern garments, textile manufacture on the warp-weighted loom and dress documented in Mycenaean Linear B, Greek and Near Eastern texts. The combined evidence is buttressed by experiments in replicating Aegean and related Near Eastern garments as well as the weave structures of patterned cloths and bands. The replicated clothes are arranged on live models who assume the various positions of the clothed figures in the frescoes and sculptures they imitate, thereby bringing the ancient figures to life. Small and Miniature Vases from Ancient Corinth: Does Size Matter? Small and miniature vases have been neglected in archaeological reports until fairly recently. They are not attractive, usually without any interesting decoration and very conservative in shape. But in Corinth they number in the tens of thousands, mostly from sanctuaries but also graves and domestic contexts. I will summarise the major shapes looking at examples from three Corinthian sanctuaries and also graves of the North Cemetery. After this survey, I will propose some reasons why miniature vases are so important, citing several ancient authors who give us clues as to their meaning and function. The Late Minoan III period on Crete (ca. 1430-1100 BCE) was characterised by substantial socio-political discontinuity following the decline of the Minoan palaces. Alongside island-wide changes in material culture, the period was marked by a clear shift in mortuary practices, which included an expansion and re-invention of the pre-existing tradition of burial in clay containers known as ‘larnakes’. Unlike earlier examples, many LM III larnakes are adorned with rich abstract painted compositions. These draw upon a wide range of floral, faunal, cultic, and geometric motifs, many already well-established in Cretan iconographic traditions. Scholarly examination of larnax decoration has typically focused on reconstruction specific elements of Cretan eschatological belief, while other potentially-important aspects of its practical and ideological role within the context of mortuary activity have received minimal attention. This presentation discusses the relationship between larnax decoration and the broader context of mortuary innovation across Crete, and will also consider its potential mnemonic value within communal funerary events. The two Elegies on Maecenas were initially included as one elegy in the minor works of Virgil in a ninth century catalogue from the monastery at Murbach. Virgil, however, had died eleven years before Maecenas and could not have described his death, which is the focus of the second elegy. Various other poets of the period have been suggested, but no-one has successfully proved who the author was. Some commentators, such as Dyer (1894) and Levi (2012), dismiss the elegies as of little value. This paper argues that there are good reasons for concluding that the author was none other that Augustus himself. If this argument has validity, it has implications for the authorship of the Consolatio ad Liviam, as both the Duffs (1934) and Schoonhoven (1980) suggest that the author of that poem is the same as that of the elegies. This paper argues that there is evidence in the Consolatio that this is not the case. It suggests instead that the author can be found elsewhere. This presentation will comparatively examine how the first emperors of Rome and China, Augustus and Qin Shi Huangdi, manipulated the portrayals of foreigners and ‘barbarians’ to generate their imperial image. By analysing the Res Gestae of Augustus and the stele inscriptions of Qin Shi Huangdi, I will argue that the two emperors’ presentation of foreigners in their propaganda was not simply limited to aggrandising their military persona. Even in the context of war and peace, both the Princeps and the First Emperor utilised foreigners as a way to elevate their moral character and display their superhuman connection to the divine. The biblical Apocalypse of John (Book of Revelation) is known for its vivid visions and anti-iconographic stance. This lecture examines the use of ekphrasis in the Apocalypse in the context of other epiphanic literature of the period. Ekphrasis becomes a way for the author to make present a deity perceived to be absent and, more specifically, to compete with the iconography of the Imperial cult. In doing so, I will show how the author participates in the agonistic synkrisis between plastic art and poetry that was a widespread topos in Greco-Roman literature and one that particularly focussed on how best to represent the gods. The wholesale confiscation of land, businesses and other property belonging to the temples of Egypt by Roman officials, starting under Augustus, generally plays a central role in our constructions of the religious and economic landscapes of Roman Egypt. But what is the evidence for such a massive program of confiscation? In this talk, I will survey the surviving evidence—papyri, inscriptions and literary—adduced in support of confiscations, as well as placing these texts in their wider historic, generic and rhetorical contexts. Finally, I will discuss some well-attested instances of religious persecution in the pre-modern world and suggest some ways in which these programs of repression or persecution (as the Roman attacks on Egyptian religious property are supposed to be) appear in the documentary, literary or archaeological records. As part of a conference later this year on maternity, I have been asked to speak on the topic of ‘birth spacing’ – i.e., the interval in time between the date of a live birth and the start of the mother’s next pregnancy – in the ancient world. The measure is an important one in demographic terms, as the length of the interval between pregnancies can have significant effects on both fertility and mortality levels, but it can also be quite revealing in social and cultural terms as well, not least in terms of the ‘control’ of women’s fecundity and health. It is also a measure that in historical terms is particularly difficult to ascertain. In this talk I would like to present some initial and wide-ranging thoughts on this topic. In the process I shall also be raising a problem I have with Cicero. The aim of my research is to identify the preferences of craftsman/stone-knappers during the Early Bronze Age in Eastern Turkey from the data of Sos Höyük which was fully part of “the Kura-Araxes Culture”. This cultural phenomenon is represented by small villages, an agro-pastoralist lifestyle and the appearance of handmade pottery fired to a red and black colour. The primarily results of fieldwork season 2017 will be summarized in this presentation. The results obtained from these analyses will help us to interpret decisions of craftsmen for producing a specific tool type in case of production area, as well as preferences of different inhabitants’ contemporary in terms of subsistence economy: herding, hunting or harvesting. In the past, the nature of Augustus’ restoration of the temple of the Magna Mater (the metroön) on Rome's Palatine hill in 3 CE has been cited as evidence that the princeps cared little for the goddess and her cult. Likewise, it has been argued that the so-called ‘rehabilitation’ of the Magna Mater in the literature of the day stemmed from a need to justify the fact that Augustus lived next door to the temple. In this paper I re-examine the metroön and its environs, and suggest that, far from being the neighbour from hell, the Magna Mater (and her temple) actually played a significant and hitherto largely unappreciated role in both official propaganda and the visual language of Augustan Rome. This seminar will feature six short presentations by University of Melbourne academics and students on current archaeological fieldwork projects, including the Marzuolo Archaeological Project (Italy: excavation of a rural Roman craft production centre in Tuscany), the Sissi Archaeological Project (Crete: excavation of a Minoan settlement), the Kourion Urban Space Project (Cyprus: excavation of part of a major Classical-era city), the Georgian-Australian Investigations in Archaeology Project (Georgia: excavation of a multi-period fortified settlement) and the Tell es-Safi/Gath Archaeological Project (Israel: excavation of a Philistine city). The seminar will end with a brief combined presentation on the Australian Mission at Jebel Khalid (Syria: excavation of a Hellenistic settlement) and on the Shirīn Initiative (Syrian Heritage in Danger: an International Research Initiative and Network), which brings together international research groups that were active in Syria prior to the conflict there and focuses their expertise on heritage protection. Helen Dale is an Australian lawyer, former political staffer, social commentator, and novelist with an academic background in Classics, English Literature, and Law with degrees from the Universities of Queensland, Oxford (at Brasenose), and Edinburgh. Her second novel, Kingdom of the Wicked, is a two-part series reimagining the closing events of the Gospels within the context of a Roman Empire that possesses the same technologies that we do. In this work of speculative fiction, Dale asks what would have happened if Jesus Christ had been around during the time of a Roman Empire that had experienced an industrial revolution. The writing of the Kingdom of the Wicked series was supported by a three-year scholarship from the Institute for Humane Studies. In this presentation I will outline the diversity of Victoria and its Aboriginal heritage and use it to explore some underlying issues in archaeological practice. For we are all continually challenged to identify the most appropriate way to organise and explain the available evidence. Both the material and the past it illuminates can be structured in many ways. The frames of reference we choose may be based on different criteria and may operate at different scales of space, time and approach, all inextricably linked to the images of the past and forms of explanation we prefer. These may emphasise particular economic, social or technological systems, create narratives or promote concepts of cumulative change. Recognising the implications of practical and analytical procedures becomes a first step in clarifying what we want to, or indeed can, know about the past and, beyond that, encourage us to think about why we want to know it. Earlier this year came the dramatic news of fabricated texts of the so-called Luwian hieroglyphic ‘Beyköy inscription’, found in the London apartment of the late James Mellaart. The discovery has provided the denouement to a long-running debate about whether the famed prehistorian of Anatolia invented archaeological evidence throughout his career. Using the ‘Beyköy inscription’ as a reference point, this discussion reviews six instances of problematic cases involving Mellaart, extending from the 1950s through to the present day. Two of these cases have apparently never been noticed, or at least not been raised in publication. Previously unreleased information is also presented in relation to the earliest of them, the ‘Dorak Affair’ of the 1950s. In reflecting on how Mellaart might have fared in our current era of ‘open science’ and codes of conduct, this discussion concludes by asking why Mellaart’s employers failed to prevent him from becoming repeatedly embroiled in controversy over his long career. Chris will be outlining his research into the highest ranking military generals of the fourth century CE Roman army, the magister militum. These generals played an extremely important role in shaping the history of the late Roman Empire and this study will outline the processes and developments that led to them obtaining the ultimate position of power in the fifth-century Roman Empire. To complete this undertaking, Chris has been conducting a prosopographical study of the fifty-five attested magistri militum of his chosen period. In the seminar, he will discuss what this process has involved and the advantages and challenges of a prosopographical approach and the initial findings of this study and where he sees it heading over the next year until his completion. Since cruelty is an attribute commonly associated today with ancient warfare, it is important to consider how the ancient Romans wrote about the subject. However, studies into the Roman view of cruelty are all but non-existent, with modern writers choosing to focus upon their own contemporary perceptions of cruel acts instead. Carissa has chosen to focus on analysing diachronically organised case-studies, in order to explore cruelty and present a definition of what Romans considered to be cruelty, especially in the context of the Republican military. In this seminar she will be primarily focusing on cruelty in Livy. This seminar questions the current scholarly consensus that East Greek mercenaries were solely or primarily responsible for the imported East Greek pottery found at a number of southern Levantine sites (Meẓad Ḥashavyahu, Ashkelon, Tel Kabri, Tel Batash-Timna, Tel Miqne-Ekron, Yavneh-Yam, Tel Sera‘-Ziklag and Tell Keisan) dating to the late seventh century BCE. It is argued for the first time that it is possible that the pottery could also be associated with Carian or Lydian mercenaries serving in the region at the time. A comparative analysis of the East Greek pottery found in the Southern Levant with imported and imitated East Greek pottery from contemporary Carian and Lydian sites has been conducted. This establishes that Carians and Lydians essentially used the same East Greek pottery in their native countries as that found in the Southern Levant. An examination of the relationship between the East Greeks, Carians and Lydians highlights their shared use of East Greek-type pottery as one of the hallmarks of a common material culture which existed among them at the time. The possibility of East Greeks, Carians and Lydians being present in the Southern Levant at the relevant time is also examined in terms of the historical, epigraphical and archaeological evidence for their presence in Egypt and the Near East. The nature of the close relationship that existed among them while serving in the region is also considered. Even the humblest plebeian in the audiences of Plautus’ rowdy comedies and of Terence’s more elegant ones thoroughly understood Jus Civile, its rules and procedures. Much humor missed today in the plays of both depended upon easy familiarity with law, the laws, and more softly enforced custom regarding slavery and freedom, patria potestas, connubium and matrimonium, client-patron relationship, debt and oral contract and concepts of res acta, bona fides and diverse injuria. Sound awfully dull? In fact it all should be (and surely was) awesomely hilarious to Romans of every order when they saw or read plays like Plautus’ Menaechmi, Miles Gloriosus, Mostellaria and his masterpiece Pseudolus (inter alias) or Terence’s exquisite Phormio — which purveys history’s first lawyer joke, a smart young playwright’s ad hoc invention for a Roman audience at the Ludi Romani [sic!] of 161 BC. The Fourth Expedition to Lachish: What is New? The fourth expedition to Lachish includes excavations at the site from 2013 to 2017. During five seasons, new data was uncovered concerning the Bronze Age and the Iron Age. The lecture will present new results concerning the Middle Bronze fortifications, a new Late Bronze temple and the Level V city. From the early 20th to the early 21st century, historians have presented a teleological vision of Roman agricultural machines, according to which successive types each superseded earlier and “inferior” types to increase “efficiency”. This picture has been based on our only complete Latin description, a 52-word passage from Pliny the Elder. It is completely at odds with recent archaeological evidence, which reveals far more varied and regional patterns of innovation. Using comparative history and ethnography can help us to consider who innovated, why and how innovations might be localised or spread. Lewit and Burton also present some results of a cross-disciplinary study of Pliny’s text, revealing that modern scholars have routinely misinterpreted and mistranslated his account, which in fact very accurately aligns with archaeological and ethnographic evidence. The complex and dense networks of interaction that linked Greece and the Near East were severely dismantled in the late 2nd millennium BCE. In the course of the early 1st millennium BCE connections were gradually restored through the agency of both Greeks and Near Eastern people, especially the Phoenicians and, by the 7th century BCE, Greek culture was strongly Orientalizing. Moving beyond the traditional art-historical concept of a stand-alone, Orientalizing phase in the 7th century BCE, this lecture promotes the concept of the Orientalizing as a dimension rather than a phase of ancient Greek culture and explores the manipulation of the East by different Greek social groups over the early 1st millennium BCE. Particular emphasis is given to the sites/regions and ethnic or other groups that pioneered the restoration of interconnections between the Aegean and the Near East; and on the regional and intra-regional variation in the modes of production, distribution and consumption of Near Eastern styles in the Aegean. In his depiction of creation, the Gospel of Matthew makes use of the ‘sublime’, a literary concept familiar to the ancient world through the treatise of Longinus, ‘On the Sublime’. In mountain scenes, sky signs and sea and land turbulence, Matthew’s Gospel shows an awareness of how the sublime operates within the narrative for moral transformation. Sometime between 400 and 200 BCE, either shortly before or shortly after Alexander brought down the Persian Empire, somebody dragged huge limestone blocks from a distant quarry to the top of the hill at Oǧlanqala in Naxçivan, Azerbaijan and began to carve them into column bases and drums. Some of these column elements fit squarely with our knowledge of Hellenistic Greek architecture, but others are a peculiar and unique amalgamation of forms from the warring Achaemenid Persian and Hellenistic worlds. Before the columns were raised, the construction site was abandoned, leaving the whole project unfinished and forgotten. I will use the evidence from this unfinished building, excavated by a team from the University of Pennsylvania and Emory University, to evaluate the nature of the Hellenization of material culture that has marked our understanding of the immediate post-Achaemenid period. Does Hellenistic hybridity take on a different meaning if it incorporates a fundamental symbol of Achaemenid centralized control like the bell-shaped base? Among the community and media, there is an increasing interest in Classics and Ancient History. The relevance of, and fascination for the discipline, often sparked by current political and social debates, films and other forms of popular culture, as well as the passion inspired by leading scholars such as Mary Beard, means that now - more than ever - Classics and Ancient History have the potential to grow and inspire. This talk looks at ways scholars can share the discipline with the community and provides some tips for effectively engaging with the media. Marguerite Johnson is Professor of Classics at the University of Newcastle. She is an interdisciplinary scholar who works in several key research areas, including Classical Reception Studies and studies of sexuality, gender and the body. She is author of several books and articles, including (most recently) "Ovid on Cosmetics: Medicamina Faciei Femineae and Related Texts" (Bloomsbury: 2016). A regular contributor to The Conversation and ABC Radio, Marguerite is also interested in strategies and initiatives around Classics and the community. Just over forty years ago, in 1977 a unique collection management initiative was proposed by Nancy Lapp to save a collection of Early Bronze Age pottery from Bab adh-Dhra’, an archaeological site in Jordan. The initiative was developed in response to an intense curation crisis occurring in Jordan, as archaeological artefacts were threatened by a lack of resources to ensure their proper care. This initiative is well known at the University of Melbourne, as the university received Tomb Group A 72 S from Bab adh-Dhra’ in 1978 due to Lapp’s solution to the crisis. These objects were transported to the University, and 23 other institutions in the United States of America and Canada, on the condition that they would be used in education and display. This seminar will discuss the role of the Bab adh-Dhra’ objects in education through an evaluation of the object-based learning (OBL) experiences of students studying Near Eastern archaeology (and related ancient world studies subjects) at the University of Melbourne. The Bab adh-Dhra’ objects offer multiple levels for interpretation and consideration in the classroom: ranging from issues covering the archaeology of death and mortuary practices to the looting and subsequent excavation and post-excavation management of the site’s artefact assemblage. In this seminar, the extensive history of these objects will be presented alongside preliminary findings from my research which indicate favourable student responses verifying the efficacy of object-based learning in teaching and learning outcomes and engaging students in Near Eastern archaeology. Increasingly the Classics are being appropriated by nationalist and racist far-right groups. This is not the first time the Classics have been utilised for right wing ideology; the adoption of similar strategies was a key aspect of propaganda for Mussolini’s Italian Fascist regime. Such tactics should hardly be surprising — the idolisation of a carefully constructed representation of ancient Rome and its continued portrayal (along with Greece) as the birthplace and original pedigree of “western” culture fit conveniently into the far-right agenda. In order to free the use of the Classics from fascist ideologies, perhaps it is time to reassess the manner in which the discipline is interpreted by contemporary scholars. Would Mussolini have taken such care to craft Italy as a third Roman Empire if Caesar’s campaign in Gaul was defined as genocide? Would current right-wing groups be so eager to utilise S.P.Q.R. as a symbol if the Roman Empire had always been construed as multicultural? This seminar will explore whether it is only through a conscious effort to adopt a more objective approach to the study of the Classics that the falsities of the fascist narrative can be fully exposed. “After two centuries of easy living, carrying out peacetime maneuvers and ferrying troops, Rome’s great navy had, like so much else in the Empire, gone soft.” Although written almost 60 years ago, Casson’s (1959) narrative of the Roman navy being consumed by its own decadence and decay still dominates scholarship. Remarkably, few scholars have studied ancient Roman naval history, and the few who have focus largely on the early period before dismissing the topic after the 2nd century. This MA thesis not only argues for its continued existence but aims to understand the transition from an Augustan naval system to that of the late empire over the course of the tumultuous 3rd century. It is my intention to develop an accurate timeframe for this evolution and uncover the reasons for its implementation, as well as provide an in-depth analysis of this system’s organization and function in the late Roman world.